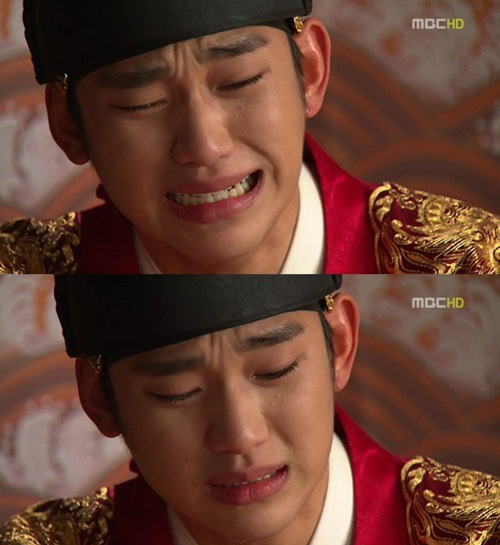 Hwon (Kim Soo Hyun) whimpers after seeing the letter left behind by Heo Yeon Woo (Kim Yoo Jung. In the episode 10 of MBC’s The Moon that Embraces the Sun broadcast on February 2nd, 2012, Heo Yeom (Song Jae Rim) goes to the room of her sister as he is missing her, and found that last letter his sister left for Hwon. When Hwon is reading the last letter left by Yeon Woo, knowing that Yeon Woo is still thinking of him at the last moment, he emotionally sheds tears. Then Hwon said, “How pain, how sad when writing these words,” and starts to sob. After the broadcast, netizens said “Looking at sobbing Hwon, I also dropped tears,” “Tears acting is not inferior to Yeo Jin Goo,” and so on. In addition, the rating for episode 10 of The Moon that Embraces the Sun is 37.1%, breaking its own highest ratings record again.